"With the epidural stimulator, I can stand, and I can move both my legs, toes and ankles. I'm working on doing sit-ups and back extensions." Similar to Kent (study participant #2), Dustin was classified as sensory and motor complete after being injured at T5. He was told he had no chance of recovery, but Dustin regained the same control of autonomic and motor functions — proving the effectiveness of epidural stimulation in four out of four participants. 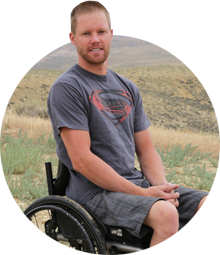 "I was paralyzed from the chest down at age 26. I was in an accident because of a tire blowout — and I wasn't wearing my seatbelt. I was thrown from the vehicle. I broke my back, my sternum, elbow, four ribs, and had bleeding in my brain — they basically told me I'd never move my legs or walk, ever." "I loved to be outside doing anything — snowmachining was one of my favorite winter sports." "Well, I can go to the gym ... I can go snowmachining ... and I generally just feel stronger and better. I'm able to spend more time doing that kind of stuff with my family and friends, too. I feel incredibly lucky."